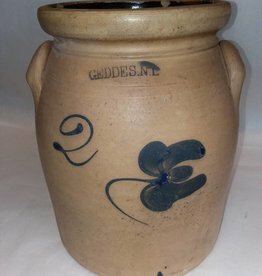 c.1875, 2 Gallon crock, Geddes, New York, Cobalt Blue flower design, no glaze. Minor chipping around inside of top. No cracks. Very, very good condition. 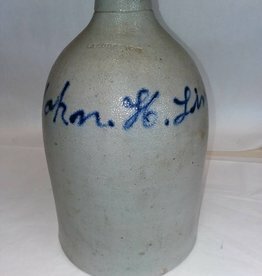 L.1800's, Geddes stoneware jug, marked in cobalt blue, John H. Link, 1 gallon, excellent condition, 1 very small chip at base (during firing-glazed over).